Films from the DC Universe have always been unafraid to start darkly and Shazam! is no different in its first reel, but where it goes from there is anything but predictable. It is equal parts superhero origin story, thesis on the redemptive value of family and a straight up comedy. Having the adult superhero be a boy inside gives great comic possibilities and these are at the heart of the humour. The boy, Billy Batson (Asher Angel) who turns into the superhero Shazam! (Zachary Levi) plays the two against each other for some great laughs. This approach helps sell the longing for family that Billy craves without dragging the film into a needy funk. Coming to grips with his emerging superhero powers also provides some very entertaining moments. The big baddie played by Mark Strong has a revealing journey of his own and when the two finally meet, sparks literally fly. The film’s positive messages are delivered with understatement and used to advantage for a big finish. 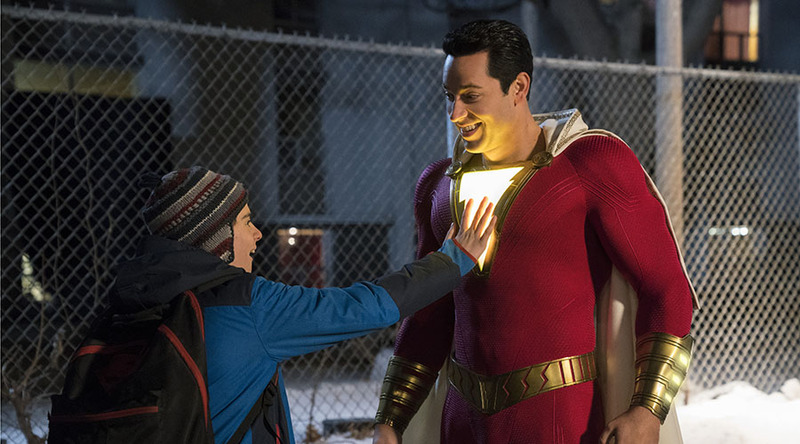 It looks like DC is finally getting to grips with a formula that will work across different age and fanboy groups as Shazam! succeeds on a number of different levels. As a self-standing work or introductory exercise, it works well at both. They are also starting to take a page out of that other mob’s books by featuring some funny and informative crazy credits.